MOON TOWNSHIP — It was a closely contested first half, but ultimately it was a second-half 19-0 run that jolted the Robert Morris Colonials (3-3) to a 76-56 victory over the Youngstown State Penguins (3-5). The win was Robert Morris’ third straight victory at home. Robert Morris, a team that has played plenty of streaky basketball through the early part of this season, continued to do so in the first half against the Youngstown State. “I thought we started the game with really good energy. Youngstown State kind of matched that and the first half was kind of back and forth,” said Robert Morris head coach Andy Toole. The Penguins were led by three-point shooting sensation Kendale Hampton who in a Nov. 16 match-up against Columbia hit seven three-pointers in a game, good for fourth in YSU history. Hampton hit five three’s during the team’s run and finished the first half with six three-pointers, well on his way to shattering his previous milestone performance. From there, both teams showed flashes of good and bad. Most notably for Robert Morris was the continued shooting struggles of Matty McConnell who went 0-for-6 in the first half while taking the most shots of any Colonial who reached the floor in the first half. Robert Morris would score some quick buckets to get themselves back on top 26-23 while Youngstown State made their final shot at the buzzer of the first half to make the score 32-31 in favor of the Colonials heading into the locker room. The Colonials locked down defensively to start the second half and, despite their own offensive struggles early, got enough good looks to get themselves up 41-32 with 15:00 remaining. in the next minute and a half, the Colonials would double their lead with a quick eight-point burst while their defense would not allow a single point. And just like that, the Colonials found themselves on a 19-0 run up 51-32 with 13:25 remaining. After struggling in the first half, McConnell found his shooting stroke as he scored six of his team’s first 14 points in the second half including an emphatic deep three-point basket. McConnell did not miss another basket for the rest of the game, finishing 4-for-10 from the field with 12 points. And once McConnell found his shot, Robert Morris found themselves very much in control of the game. The Robert Morris lead would get as big as 19 points but Youngstown State continued to play tough as the Colonials once again got cold from the field. A quick 12-5 run for Youngstown State would make the score 55-44 as the Penguins tried to trim the lead down to single digits. But the Colonials were having none of it. Robert Morris looked at their 55-44 lead and put up seven more of their own including a once-in-a-lifetime Matty McConnell slam dunk off of a steal. “Even when they cut it to eleven there, about nine and a half to go, it was great to see the response we had when we were then able to go on a run of our own,” said Toole. And while the Colonials offenses looked brilliant, the defense for Robert Morris was equally as impressive. After his six first-half three-pointers, Kendale Hampton was held to just a single three-point basket after torching RMU in the first 20 minutes. The Colonials forced nine turnovers in the second half and 18 total. Defensively, Robert Morris was led by Jon Williams, who finished the night with four steals to go with his 12 points, 3 rebounds and 3 assists. “Like I said, happy with the defense, happy with the balanced scoring, liked the fact that we only turned the ball over seven times against a team that has been forcing teams almost 14 turnovers per game,” said Toole. 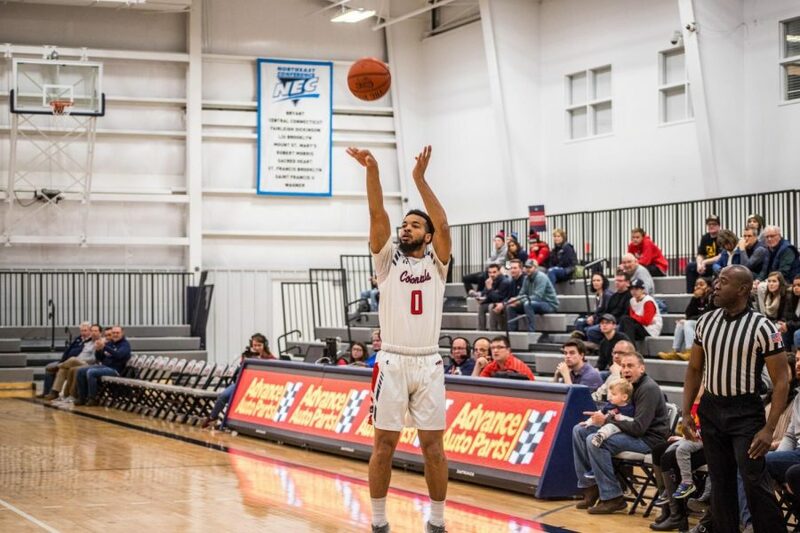 The Colonials earned their third straight win at home by a final score of 76-56, going to 3-3 on the season with one of their most impressive victories of the season. Their next game will be on the road as they look to take on the Drexel Dragons (3-4) who are coming off a close 70-67 loss to the NJIT Highlanders (7-1) that they suffered earlier today.